If LaLD had a missing persons’ report, I would’ve undoubtedly topped the list - having last seen with a post describing my visit to a collector’s toy fair in April 2016. Since then, I’ve taken a long hiatus (3 months short of a year!) from posting - be it on my social media accounts or anywhere else. Life after college began and that spiraled into me spending my time off work by gaming and other activities in between! Still, that never stopped me from coming back here every day and I’m very happy to see the influx of so many new readers from all over the globe! It’s one thing to grow, but to grow so fast and well (I see the kid-friendly atmosphere is still alive and kicking) is something else entirely! Congrats all, keep it up! Anyway, enough rambling, let’s get down to business with what I have for you here today - my most unexpected and best purchase of 2016. 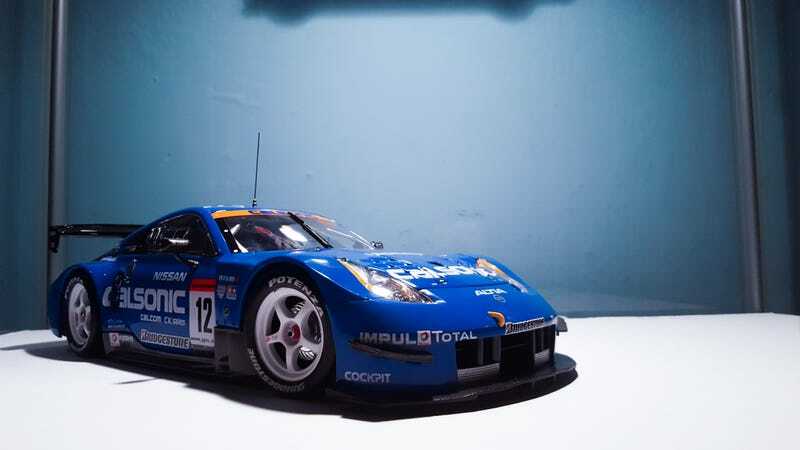 Immortalised here in 1:24 scale by the now sadly defunct Hotworks Racing Factory, this particular model - designated as the Calsonic/Impul Z by the manufacturer - was from the early years of its career. As far as models go, Hotworks have always hit the mark (you can read my R34 review linked at the end at the post) and it continues to show here. Poise and purpose oozes from whichever angle you choose to adore it from. The vibe this car gives out - like a tiger waiting to pounce - shows in its stance, low and planted firmly to the ground. Moving on, the paint quality is evenly applied and is of great quality - judging by the way it has held up very well for this long. The livery - paying homage to some of the biggest brands in Japan - are all present and correct with no signs of imperfection. Detail-wise, this car is very similar to the brand’s other efforts. While perforations are replicated with black paint and mesh effect, they do not skimp out on other details. For example, it’s obvious they paid lots of attention to the wheels, tyres and brakes: the detailed AP Racing units hiding behind Bridgestone slicks wrapped Enkei NS-GTs are my favourite part of this car! Peep the cross-drilled discs! The craziness does not stop at the back of the car. The aerodynamic pieces - bulky overfenders, huge carbonfibre wing and massive diffuser are all wonderfully replicated and like the rest of the car, have great build quality. The side-exit exhaust pipes look very realistic and gives off the impression that they’re made of metal. This is another favourite angle of mine, nothing shouts aggression more than side-exit exhausts and wide fenders! Carbonfibre Craft Square mirrors are beautifully....uh, crafted. ...along with a tyre pump and a set of wet tyres! And here’s how it all culminates: a magnificent package, akin to the car having its pre-race prep. All in all, this is an amazing model and definitely one to keep for many, many more years to come. Thank you very much for reading all the way through here and as always, there’s bonus pictures for you! There’s a couple of review links posted below as well, so new users do take note! Great mix of photo-etched, physical and tampo prints. The closest we can get to the interior - everything is sealed! And on that pop and bang it’s time to end the article. Thank you all very much for taking the time to read! Till next time, Viva La LaLD!